A touch of Christmas comes to life in this beautiful bouquet. Ideal for those looking to broaden the spectrum on the colours of Christmas, with the pink hues, calming whites and green foliage combining to create a truly elegant bloom. 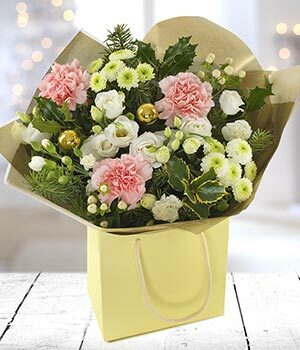 These fabulous florals can be delivered to your lucky recipient on the same day if you order before 3pm, make their Christmas even brighter.